Should Poker Be Considered A Sport? The definition of sport is, “an activity involving physical exertion and skill in which an individual or team competes against another or others for entertainment”. There is a fine line when considering whether or not something should be considered a game or sport. Poker falls right into that category. It was invented in the early 1800’s and has been growing ever since. The problem when comparing the definition of sport to poker is how there is no physical activity when playing. Although this may seem like a reasonable deciding factor, it is not be that simple. I think the main argument comes down to weather or not people believe poker is considered gambling. Speaking from experience, I know that poker in the long term heavily is more skill weighted then it is luck. However, people who do not play will ultimately think of it as a gambling game as it takes place in casinos. The main difference is that in casinos, poker is the only game where you are playing against other people and not the house. There is no clear cut answer on whether or not poker should be considered a sport but with my knowledge about it, I believe it should be. If people believe the definition of sport should not involve the physical aspect then poker should definitely be considered one. It is a game that requires a ton of skill in order to be successful in the long run. This is shown by the professional poker players who make a living doing so. The world series of poker (WSOP) is an annual poker tournament series which runs in Las Vegas. In 2003 during the main event of the world series, Chris Moneymaker, a recreational poker player came first place for a total prize of $2,500,000. This sparked what is called ‘the poker boom’. A lot of attention was brought to poker because of this. People saw this guy who barely knew anything about poker win the tournament and it started the boom. This directly goes against the argument of how poker is more skill then luck. However, poker tournaments require a ton of luck as they usually take place for 4-7 days. There are many different types of poker but tournament play is one that requires a high amount of luck for one tournament but over the course of a lot, the skill factor goes way up. 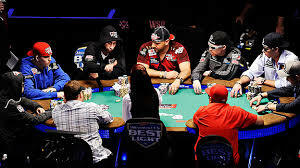 The WSOP takes place every summer for a period of two months. It is a time where mainly every professional poker player goes to play a bunch of tournaments. The prize-pools that these tournaments generate are outstanding. There were a total of 68 events this past summer. The main event, which is a $10,000 buy in, accumulated a prize-pool of around $60,000,000. The first place winner won $7,683,346. This type of money is right up there with the highest paid professional athletes in the world. The amount of money that these players make is also another factor in why I think poker should be considered a sport. Poker is something that people have to study and train for a long period of time. This is similar to any other sport that is played on a professional level as those athletes also study and train for a long period of time. The highest earning poker player from only tournaments is Daniel Negreanu who has $30,686,160 in lifetime earnings. Negreanu is from Canada and has been a professional poker player for around 20 years. Advertisement is one of the biggest factors during the WSOP. Sponsorships and generating advertisement revenue are also key factors on why poker should be considered a sport. In all other major sports it is a business where tons of advertisements take place. An example of this is the Superbowl in the NFL. A 30-second ad in this years Superbowl was approximately $4,500,000. Poker is also a business generating money from advertisements as well as the player who are mainly sponsored. Online poker is another major aspect of what makes poker so popular. Poker can be played online against anyone else in the world as long as you are over the age limit which is 18 years old. The poker boom in 2003 had a huge affect on online poker as it grew at a rapid pace. People fell in love with it as there was a ton of money to be made from the less experienced players who just started out playing. Moneymaker started that trend of amateurs starting to play because he gave them all hope after his big win. Moneymaker won at online satellite tournament for $40.00 which gave him an entry into the $10,000 tournament he ended up winning in 2003. This was the story that people loved and everyone wanted it to happen to them. One of the most appealing aspects of poker is how there is a luck factor involved. One of the best poker players in the world could sit down with someone who does not understand much about it and can still lose. However, if these two played 1000 matches, the professional would almost certainly win the majority. There are a lot of athletes who end up playing poker after they are finished there careers. The reason for this is due to the competitiveness it brings. Examples of athletes who play poker are; Michael Phelps, members of the Manchester United Squad, Paul Pierce, Shane Warne, Steve Davis, and many others. The competitiveness and drive is what these athletes love about the game as it has many similarities with all the other sports. A perfect example of a sport that can be compared to poker is billiards. Billiards is a sport that involves minimal physical activity but a ton of mental focus, just like poker. If billiards is considered a sport then poker must be considered one as well. When a game is played on many different levels, such as; recreationally, occasionally, part-time, or professionally, I believe it should be considered a sport. On the ESPN homepage, poker is listed as a sport due to these reasons posted above. Poker should definitely be considered a sport. Should Pete Rose Be Reinstated? Can Sports Officials Change The Way The Game Is Played?